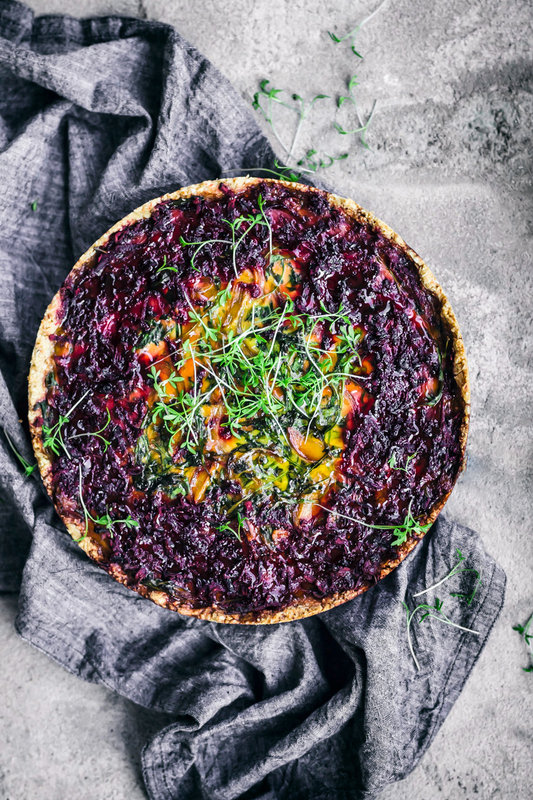 I’m sharing a new favourite today – this gluten free beet tart made with shredded beets, potatoes, greens, and eggs. The base is a mix of chickpea and oat flour, and press in! No rolling needed! Note that the tart shell is a touch on the crumbly side but does slice nicely. 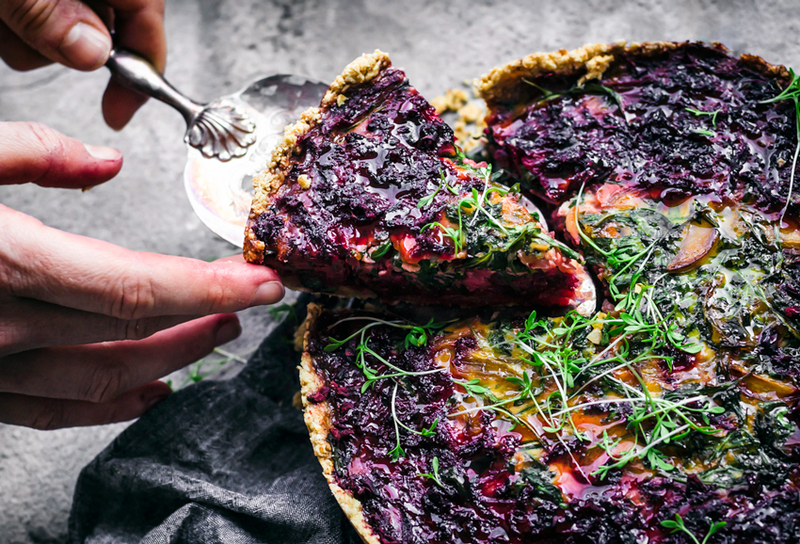 If you grow your own beets or get them at the market, they might have a nice bundle of greens on top, and that’s what you ideally want to use here. I can’t get beet greens at this time of year so I used rucola, and you can throw some spinach or swiss chard in too. The point is to be low-waste so this is a good way to use the whole plant. There’s a layer of shredded potato under the beets and eggs for a little extra heft and really just because potatoes are excellent, which makes this is a full meal in itself. It’s great cold, too, so you can bring it for lunch the next day. It’s a real stunner with the dark purple beets on top giving way to the fuchsia centre when you cut into it. I know that I haven’t really been living up to my blog name for the last couple of years, but I do throw the occasional egg recipe into the mix. This week was a bit of a fluke with two non-vegan recipes (these double chocolate cookies were the other) but I know plenty of you aren’t vegan and you obviously know that I’m not. All the recipes will remain free from dairy and soy as always and the vast majority will be plant based. This recipe is inspired by one from one of the Green Kitchen Stories cookbooks, but I can’t remember which one. They’re all sitting at my mom’s house. I would think the first one, but I’m not sure, and I think it’s fairly similar, so I wanted to make that clear. 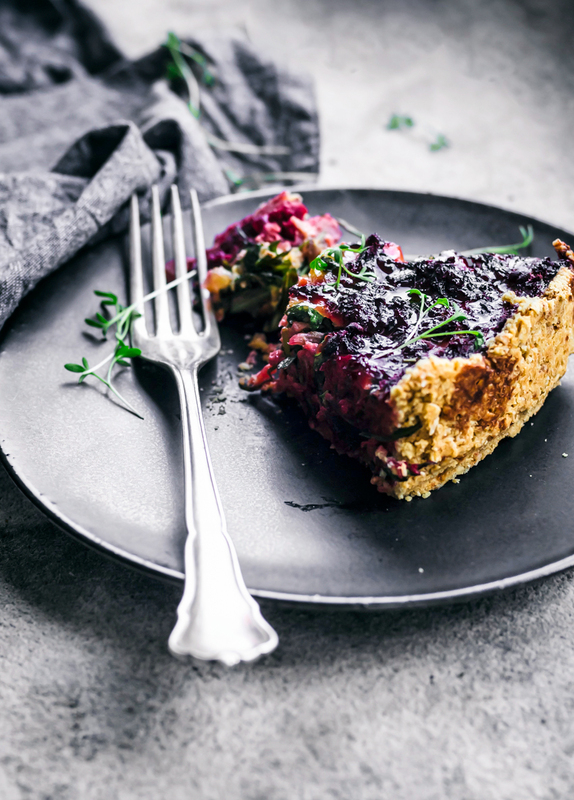 To make the tart base, oats are ground into a flour using your food processor, then mixed with the remaining ingredients. Water is added a tablespoon at a time until a dough forms, and then you just press that into a greased springform pan. It is possible to make the base without a processor – just use store bought oat flour, then mix it with the dry ingredients in a large bowl. Use your hands to blend in the coconut oil, then add the water a tablespoon at a time and mix with your hands until a dough forms. 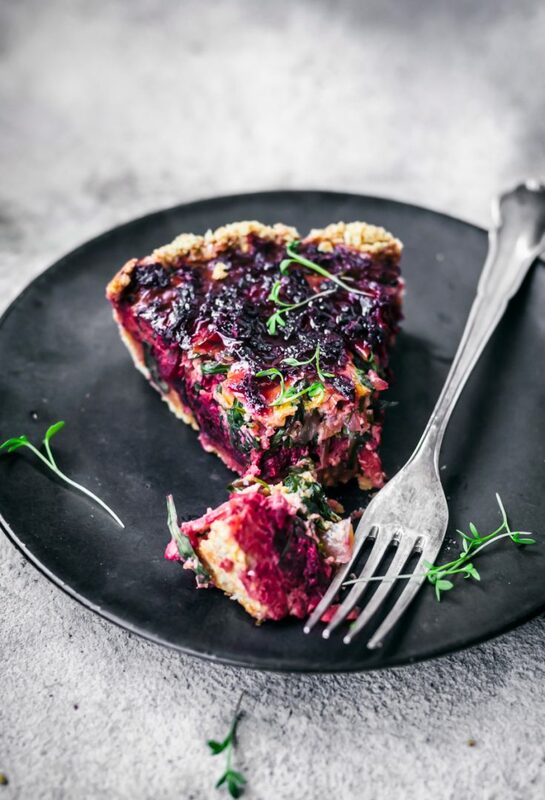 Potatoes and beets are shredded with a box grater, then added to the bottom of the tart. You top it off with an egg, sautéed onion, and greens mixture, then add a little more shredded beet around the edges. After baking, it’s served with a drizzle of honey for a touch of extra sweetness. 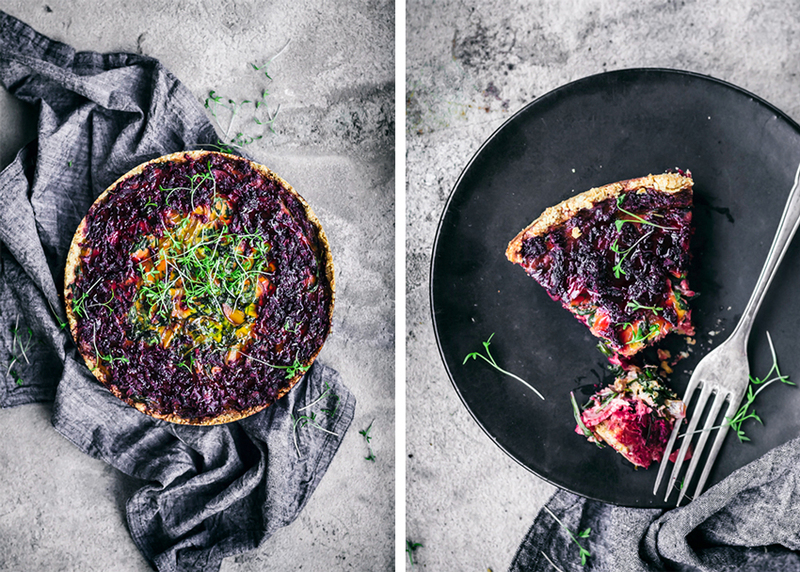 It’s a beautiful tart and just right for spring, autumn, and even through winter. 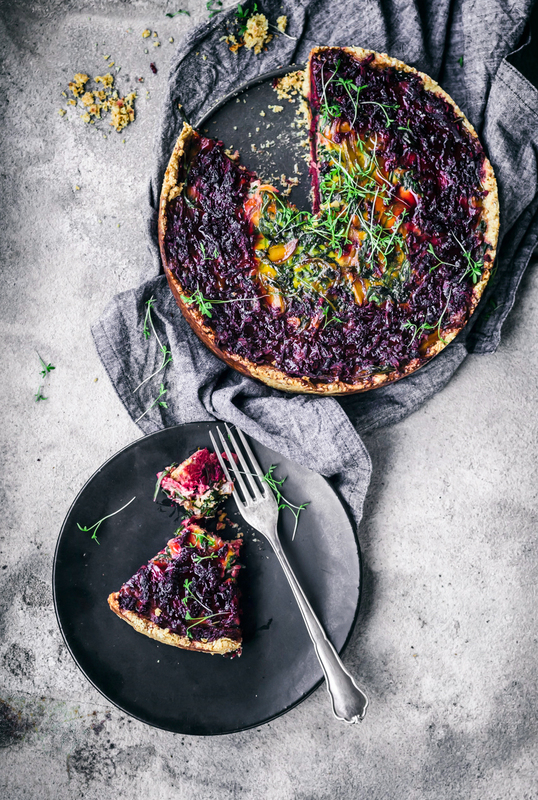 This dairy and gluten-free beet tart is surprisingly simple to make, with a press in chickpea and oat flour crust, and shredded potatoes mixed with the beet base. 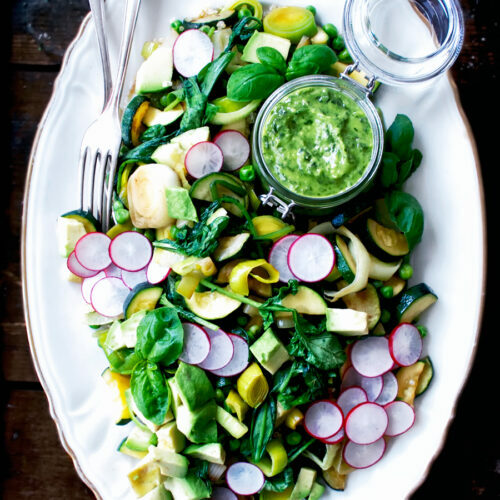 It makes a beautiful weekend lunch or easy weeknight dinner. Grind the oats into flour in your food processor, and add the chickpea flour, salt, and coconut sugar. Pulse to combine and mix in the coconut oil until it resembles sand. Add the water a tablespoon at a time, mixing between each addition, until a loose dough forms. The dough should hold if you squeeze it between your fingers. Press the dough into the pan, extending it about 4cm up the sides and trying to get an even thickness. Poke the base with a fork a few times and blind bake for ten minutes. Heat a pan over medium heat with the coconut oil. Add the onion and cook for a couple of minutes, until softened, then add the garlic and cook for another minute. Add the balsamic vinegar, stir, and remove from the heat. Stir in the greens to wilt slightly and set aside. Place the grated potato in the base of the blind-baked crust in an even layer. 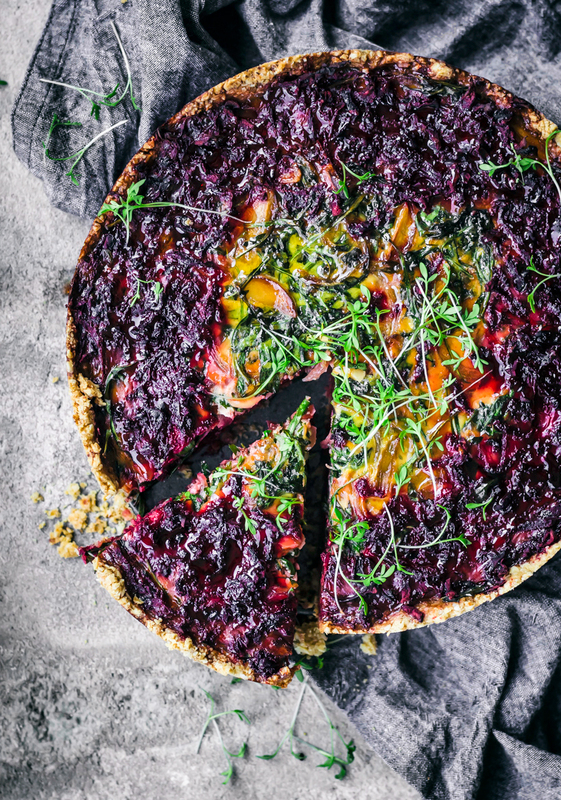 Reserve a small handful of the grated beets, set aside, and add the remaining beets to the tart. Whisk together the eggs, milk, and spices. Stir in the onion and greens mixture, then pour into the tart base. Top with the reserved beets around the edges. Bake for 35-45 minutes, or until the centre of the tart is firm to the touch. Cool in the tin for a few minutes before removing the sides. 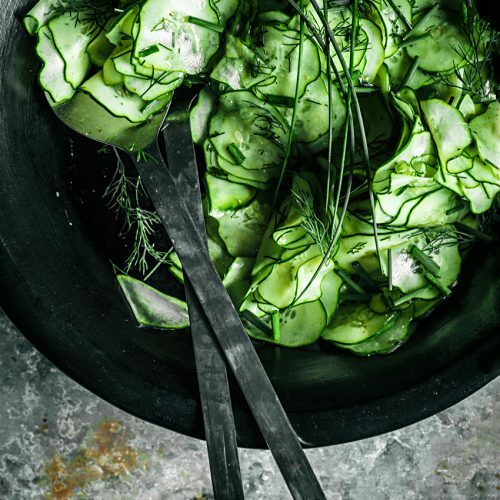 Serve hot, topped with a drizzle of honey and cress or sprouts if desired. 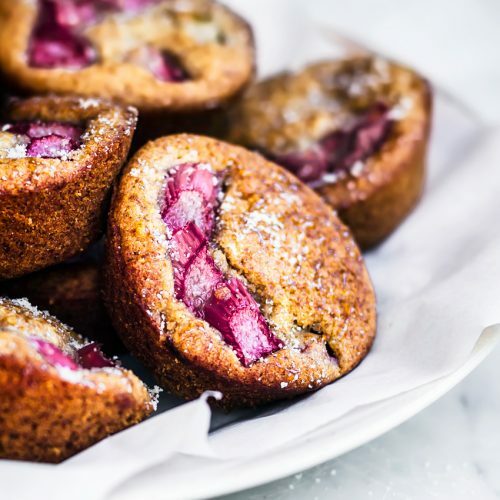 • I don't have a tart pan, but of course you can use one instead of a springform. Just adjust the cooking time accordingly. 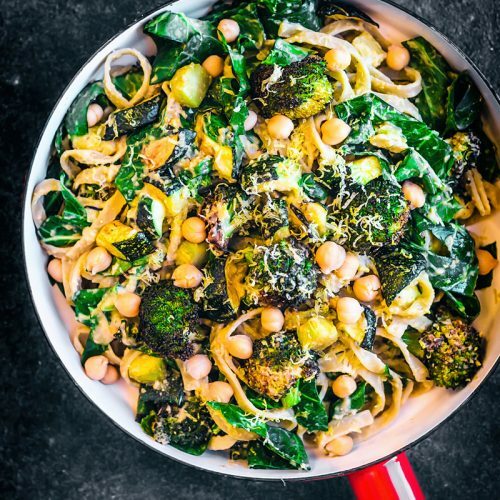 This recipe was originally published in February 2018. It has been updated as of March 2019.